Californian death metal pioneers POSSESSED will release their first full-length album in over three decades, "Revelatons Of Oblivion", on May 10 via Nuclear Blast. 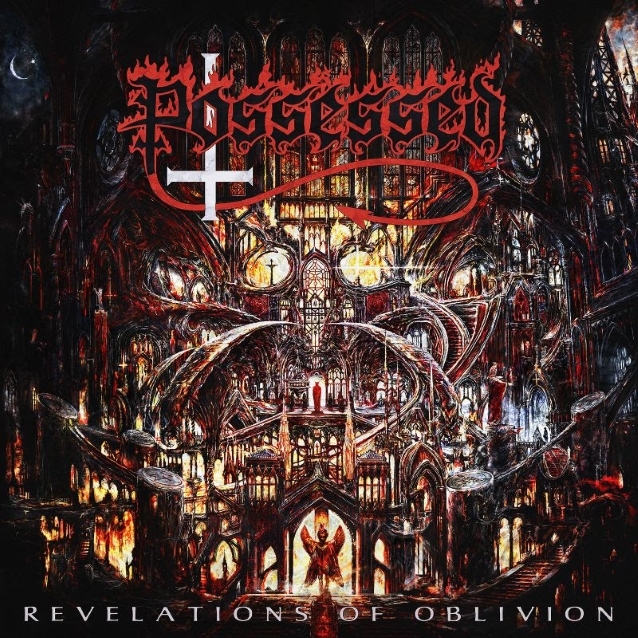 POSSESSED frontman Jeff Becerra said: "This album from start to release has been a fantastic experience. All of us in POSSESSED hope you enjoy this newest release and we look forward to touring and creating much more new music in the future. We appreciate all of your support and dedication. Hope to see you during our upcoming tours & shows soon. Thank you to each and every one of you for your inspiration and dedication to POSSESSED." "Revelations Of Oblivion" was recorded at NRG studios and Titan Studios with Becerra as executive producer and Daniel Gonzalez as co-producer for the album. Mixing and mastering was handled by Peter Tägtgren (HYPOCRISY, PAIN, BLOODBATH) at Abyss Studios in Sweden. For the artwork, the band enlisted Polish artist Zbigniew Bielak (PARADISE LOST, DIMMU BORGIR, DEICIDE, GHOST, GORGUTS) to create a piece that brought back the notion of true fear that was once associated with the idea of evil. Said Jeff: "Working with Peter was a fantastic experience. We put a great deal of thought into who we wanted to produce our new album. Since we hadn't made an all-new material release in well over 30 years, it was essential that we found the right person. Peter's name kept coming up over and over, and after speaking with my bandmates they all really liked Peter as he is more organic, and somebody we felt would fit in well with our process." Same, but I just hope it's not so Nuclear Blasted. As with every album after a reunion/long hiatus, I will remain very sceptical until I hear samples. This is definitely much better than most of these post reunion albums based off of that one track. I don't really like the vocals though. They seem kinda weak. The rest of it is good though. not bad. i'm getting a bit of a Beyond the Gates and The Eyes of Horror vibes from this. i swear, is it me, cause i think Jeff Becerra's voice sounds like it hasn't even aged, he sounds the same to me, lol. (03-15-2019, 10:11 PM)Heavy Thrashhead Wrote: i swear, is it me, cause i think Jeff Becerra's voice sounds like it hasn't even aged, he sounds the same to me, lol. It's probably one of my hipster opinions popping up again. You're right. He doesn't sound really much different than on the classic Possessed stuff. Something about them here rubs me the wrong way though. I'm not sure. This is not so bad for a band that hasn't produce an album for 33 years. Let see how the whole album goes, despise of me despised of Nuclear Blast label. Quote: Your priorities Are wrong. Your faith Is blind. Crush the weak Uphold the strong. Burn the brains Of mankind. I was just going to post about this album here, hehe. I'm glad to see they're back, even that it has only Jeff from the original line up. The new song is good, great old school death/thrash! I like it, but the production sounds slightly too modern for my taste. It doesn't make me not like it, but to me old school thrash and death metal was meant for the 80s production quality. I guess in this day and age, we can't expect all albums to have the same sound quality as the 80s albums. I love it when something new comes out that has the 80s sound quality though (Sabire, Enforcer, Ranger, Bewitcher, Solicitor, the new Iron Angel album, etc). On top of that, people are shitting on this incarnation of the band because there's only one original member left. I get that people may not dig the production or whatever, but the Sadistic Intent guys made it possible for Jeff Becerra to reform Possessed, thus continuing to play our favorite songs from classic releases such as Seven Churches. If you knew why Jeff did this now, you'd be disgusted. The reason he's getting away with it is because Possessed's long time business manager Debbie Abono died. Mike Torrao was at her funeral. Jeff was not. With her death it gave Jeff the chance to usurp the name without reprisal. Mike is totally against this but without Debbie no legal action can be taken. Jeff has no support from Mike Sus either. He hasn't even talked to him since 1999. That's really bad, I didn't know that. So sad that they are at this situation. Live video of "Shadowcult" is up.